The Pass Test Hair Detoxifying Agent covers up the unwanted toxins in the hair, such as cocaine, THC, ecstasy, nicotine, environmental, and chemical pollutants. Toxins get distributed in the body through the bloodstream, as well as hair that absorbs it from the environment. Hair covered with gel and also the wet hair is at high risk of environmental pollution. After the toxins get ingested, the blood feeds in the hair at the time of growth. With the hair growth, toxins get entrapped in hair follicle. The Pass Test Hair Agent covers up the hair by an organic film, similar to conditioners. The manufacturers who carry The Hair Detox Test Shampoo have a 100% money back policy, which if this product does not meet your standards you get a full money back refund for the product. At the time of drug or nicotine testing, the examiner cuts the hair sample from the back of the head close to the scalp. Thereafter, the hair sample is sent to a lab, where it is dissolved with organic solvents. In the liquid solution, toxins get freed from hair follicles. With the help of an extraction, the nicotine or drug toxins get removed from the liquid. After the drug or nicotine metabolites are set apart, GC/MS is executed on the hair similar to the way performed in the urine analysis. With The Pass Test Hair Agent, the traces are not detected, since examiner picks the sample of hair the shampoo accompanied with it, goes with the hair. After dissolving of hair, the balance resulted from shampoo is independent to move on drug or nicotine metabolites that are entrapped in hair follicle covering the toxins. The manufacturers who carry The Hair Detox Test Shampoo have a 100% money back policy, which if this product does not meet your standards you get a full money back refund for the product. Agitate The Pass Test Hair Agent well previous to every use. Take half content of the shampoo and massage on the scalp, following the technique from the scalp towards the hair ends. Make certain to cover complete portion, especially the hair close to the back of the neck. Follow the same procedure, with the rest of the bottle. The Test Pass Shampoo remains effective for up to 10 hrs, before the blood flowing through the system restores the toxins in the hair. 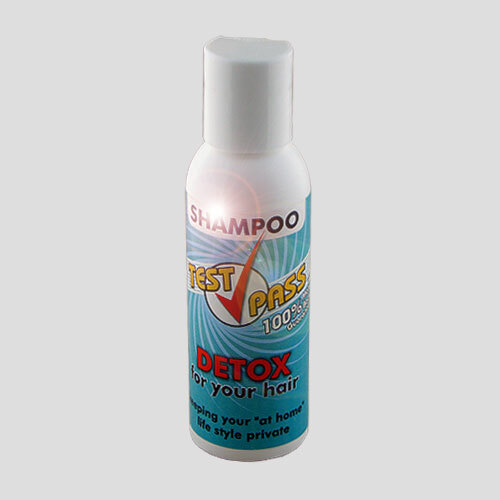 People having long or thick hair require additional bottle of The Pass Test Hair Detoxifying Agent. The Pass Test Hair Agent is only made for external use. The guarantee of The Pass Test Hair Agent is withdrawn due to conventional tests cut off values 0.1ng, in effect of zero tolerance levels. The Pass Test Hair Agent is not planned to be used on legitimately monitored drug tests, and needs to be performed in harmony with state and federal laws.